Solar/battery operated radios will work when your cell phone won't — not that they do the same thing, but most emergency radios also have cell phone chargers built in. A solar, battery operated, or wind-up radio will come in handy when you really need it. It's important to stay informed during an emergency. We purchased a Kaito Voyager radio, and it has pretty good sound if you just want to listen to music. We take it camping just for that reason. I leave it sitting on a window sill so it is always charged. It has AM/FM/Weather band radio receiver and can operate without electricity or batteries. The four power sources give it maximum charging flexibility: built-in lithium rechargeable battery, Micro USB input, a built-in solar panel, and dynamo crank power. Charge your smartphone, GPS, or other USB device directly from the radio with the Voyager’s USB output. Transfer your favorite songs to a microSD card, insert it into the radio. It even has Bluetooth capability and a reading lamp. Four hours of charging in the sun and the internal battery lasts about 24 hours and the radio will run about 100 hours on 3 AA batteries. 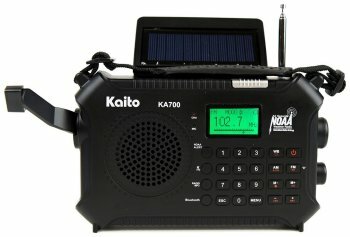 Note: There are several varieties of Kaito radios in different prices ranges. The Eton Scorpion solar powered radio and flashlight will fit in your 72-hour pack or just attach it to your belt with the carabiner that comes with it. It will charge just by laying it out in the sun or hang it from your pack. With a powerful 3 LED flashlight as well as a variety of radio bands, it will keep you up to date with the latest information. Plus it has a USB cell phone charger that provides emergency cell-phone power when cranking the dynamo. Add to those features an Audio line input (AUX) that automatically works when an external device is plugged in, aluminum carabiner (makes attaching the Scorpion to items easy), rugged exterior skin for protection, battery-charge indicator, bottle opener for use with standard glass bottles, no batteries needed,DC power, IPX-4 splash proof rating (protected against spraying water from all angles at 10 liters/minute at a pressure of 80-100kN/m2 for 5 minutes).